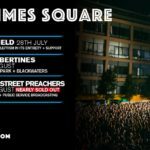 Live From Times Square – preview"
In just over a weeks time this years Live From Times Square gets underway with another stellar line up of incredible acts. Sonic Mania And Summer Sonic Festival 2013 Tokyo – Festival Previews"
Louder Than War’s Far East correspondent gives us the low down on two of Japan’s upcoming festivals, Sonic Mania And Summer Sonic Festival. The Gramotones: Manchester – live review"
A sound distinctly uncontemporary, steeped in the music of the 1960’s and the years that bookended the crucial decade. Tribes & Blue Lip Feel: Preston – live review"
Tribes were triumphant as they wowed their fans from the North West at Preston’s excellent 53 Degrees venue. Thomas McConnell Interview by Roisin Kelleher"
I remember hearing Hello Goodbye in the car when I was really really little and I used to dance to people talking on the TV when I was about 3.